T-34/85 RUDY in the current meta. Needs a buff? Hello, Im new here; and I know, that Im totally not the greatest player. Just trying to have fun and keep winning, in this game. I love my T-34/85 RUDY (my most driven tank at 54%), but considering it got a bit powercreeped with the time, I recently send WG a ticket via their Customer support, about the RUDY, since it has issues in the current meta. Just wanted to share my ticket with you, so you could decide if my opinion on this tank is justified. I can totally understand that this kind of is off-topic, but I would really appreciate it, if you could hear me out. The T-34/85 RUDY; the tier VII soviet medium tank, even back then, it had many issues in terms of penetration, since it had to deal with these hordes of armored heavy tanks and tank destroyers with beastly guns, which could easily take half or full of its hitpoints with one shot. Now, in the current meta, not much has changed. But with the introduction of the german superheavies, it lost its actuality and got powercreeped, being outdated. To actually deal damage, it always has to switch to premium ammunition, which only has 194mm of penetration. Even with these numbers, its unable to pen heavies, or even some medium tanks frontally, or even sideways. Meeting tier 8, which is overflooded by IS tanks and many other different tanks like the Superpershing or T-54 mod.1, it cant effectively deal any damage, even using APCR. Even trying to pen the sides or rears of heavies, it struggles, just looking at the spaced sides of russian heavies. Now, with the introduction of the VK 100.01 (P), it got even worse. The Armor of the T-34/85 RUDY isnt great either, being penned by everything even a tier lower. The stats-wise 75mm of armor in the front of the hull, are only on the upper plate, and even there, the drivers hatch, MG port and the lower plate have 45mm of armor. Getting to the turret, you can see that it is even worse, than the one on the Tier 6 T-34/85, since it has a really big, oversized commanders cupola, like on the STOCK turret of the tier 6, on an already not very strong turret, where you have no armor behind the 90mm of spaced armor in form of the gun mantlet. The main question I have is: why does the RUDY have so many disadvantages? The tanks it has to compete with are in many ways stronger than it. - The T-34-1 for example is only as half as big, while having a way stronger turret and a in many points stronger gun. Higher alpha, but lower DPM. but what does DPM bring you if you cant use it because of bad penetration? The T-34-1 has the penetration of a tier 8 russian medium, while even having more DPM than a T-54 mod. 1 for example. it has 175mm of pen on AP, and 235mm on APCR, why not implement it on the RUDY? - Why does the tier VII T-43 have a way stronger turret and hull, while having only unsignificantly lower mobility? The RUDY has a ONLY 75mm frontal upper plate, but even this, has only 45mm of armor on the drivers hatch and MG port. Who gave it this underpowered hull armor? I wont even mention the sides and the rear, which have less armor than the Tier V T-34, and are almost twice as thin as the ones on the T-43. The armor didnt work that well on tier 6, so lets put it into many tier 8 battles? Why does the RUDY have a stock turret of a tier VI tank and a tier VI gun? - The Type 62, kind of a chinese counterpart of the RUDY, has 250mm of penetration on premium ammuntion, not having issues penetrating tier 8 tanks, unlike the RUDY. Not to mention, it has way better mobility, being able to use its gun more effectively, getting to the sides and rears of heavies armoured tanks.Yes, it has worse armor, but who cares if you shoot at 45mm or at 30mm? Not to mention, that the RUDY is almost as twice as big, with a big cupola. -I wont even mention the overpowered HELSING and DRACULA. - Many tier VII mediums have better penetration, like the T20, LTTB, AMX 13 75 on APCR. But even many Tier 6 tanks have more penetration, including the VK 26.01, the Sherman Firefly, the ARL 44. The tier VI ARL 44 even has more AP penetration than the RUDY on APCR, while having good DPM and gun depression? I hope you understand my worries, and dont just respond by ''thanks for the ticket, but we cant do anything'', because it really took some time for me and I really wish you could overthink on how to improve this tank and the current meta, because it really is in some point powercreeped. A buff would fix the sítuation, like you did back then with the superpershing. 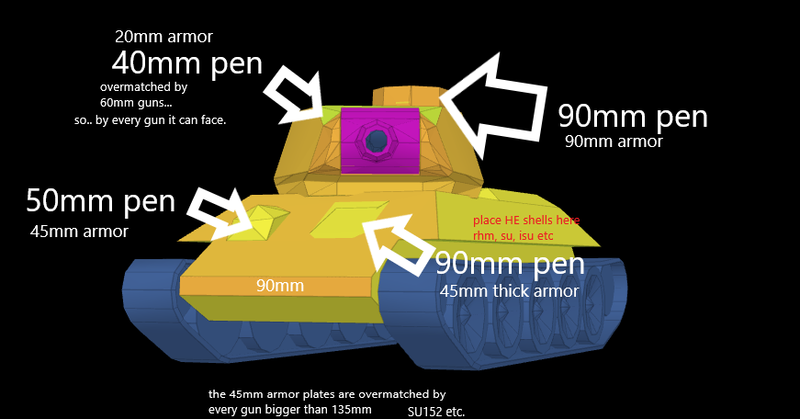 More pen to keep updated on the level of the T-34-1, the upper front plate being overthought or just improved, a slightly smaller turret commanders cupola like on the tier VI t-34/85 or T-43. I think many would appreciate this, and not have an issue with nerfing the DPM a bit in exchange. Edited by HighExplos1ve, 16 December 2018 - 09:39 AM. I don't think so. Even playing as badly as I have been recently, I'm finding it fine. Most of the nominally OP tanks are being driven by players who couldn't find their arse with both hands and a map. Hy, welcome to the forums. Fun tank, had no issues with it of late, and given it’s up against Golddiggas, Dracs and the like, if WG did anything to it, it would be the mother of all Nerfs, so let’s leave it as it is! The tank in fact is great, I kind of love it. I just really struggle with the pen against those hordes of russian heavies, because with even with calibrated shells, you can NOT reliably pen the front. Lets not forget the russian bias, which let your shells magically bounce of grey zones or even the sides with the tracks and spaced armor. The comet has 208mm on APCR, only 14mm more, but this difference makes the said above possible. Ok, you think it’s weak, in fact it’s almost OP. Compared to the SPershing it has speed and more rof. Compared to Comet it has higher alpha and armor. So you want a high alpha, high pen gun on a fast and armored tank. Never will happen. Basic advice, you don’t fight heavies frontally in a med. If you can do this, your med is OP. Edited by romsitsa, 16 December 2018 - 08:33 PM. That piece of basic advice is quantum physics to most players. The comet has more pen, gun depression, a better turret without the big, oversized commanders hatch. 75mm angled or flat, an ISU doesnt care and will take the half of your life anyways. ''Dont get in front of an ISU''. But we all know that feeling of getting a 640 dmg shell. The SP is a tier 8 heavium, hard to compare them. It has more pen on AP than the RUDY has on APCR tho. ''Dont get in front of heavies'' - easy to say, but hard to do in the small maps on BLITZ. On the medium lines, you meet SPs, T54 mod1s and other stuff, where you ll struggle to scratch them. Mobility wise, the RUDY is great tho. I have almost 1k battles @54% on the RUDY, and im ok with everything, if it only had the pen of an LTTB, everything would be fine. Overpowered? I dont think so. Tier 7 is flooded with overpowered tanks, Helsing, Dracula, the Type 62 with its pre-medium-tanks-nerf penetration of 250mm, etc. 640 dmg leaves enogh HP to cod an ISU. And once again, if you start to trade with heavies head on, the med shouldn’t win. Do you remember the pre prammo nerf T-54? Why do you want one in tier VII? ISUs normally sit in the bushes, and hide after a shot. Have fun CODing it from 200meters. just look at tanks like the type 62, Dracula, Helsing... all have better pen. Edited by HighExplos1ve, 20 December 2018 - 12:08 PM. Type is a light tank, better pen, mobility, camo, viewrange. Dracula has better pen, gun depression, mobility, silhouette, an insta-repair-track, and flies around. Btw, Cant be penned by HE sideways, because of spaced armor. Helsing has 400 dmg every 8.9 seconds, with better pen, armor. No. RUDY is all fine. It’s pretty well balanced (contrary to Drac and Helsing foremost, some of the most op tanks in game even if current meta benefit heavies more)). It is not a viable solution to inflate individual tanks performance by comparing a well performing tank with clearly unbalanced tanks. There is no such thing you call “meta”. In Reality what you call “Meta” is the lack of knowledge how to play proper in Teams i.e. with all the tank classes. If you know how to play correct, you can easily play WITHOUT Repairs/Healing and WITHOUT Prammo. The Rudy is also one of the strongest meds in its class and therefor, in my opinion, don’t need any buff. Ofc there is a “meta”. There is always a “meta”. This is a statical context. Meta can teoreticlyl be balanced, but will in reality always be unbalanced to some extent. That certain tanks, or tank classes, should be played in different ways, or that individual player (or some borderline op tanks like Dracula or Kenny) will break this pattern is not proving there is no ”meta”. Edited by Cookiebile, 13 January 2019 - 01:20 PM. Lol you are funny, inventing “proofs” I never mentioned. As I said. If you can play proper with your team mates, that means dealing correct with both line ups, you can always make the difference and that without repairs and special ammunition! But you are right somehow. There is always some sort of unbalance between tanks and/or tank classes BUT the result of us players just following this path doesn’t mean we couldn’t do better. The point is, nobody (except me) is playing like they should be cuz all of you are just following your own interests. Really? Inventing? Hmm. well, you were actually saying there was no meta, and now you say there is a meta. So I guess I’ll leave it here. Edited by Cookiebile, 14 January 2019 - 09:12 AM. Man you have difficulties in reading. First you are talking about certain tanks that brake a pattern which should not be seen as a nonprove for a meta, something I was never talking about. Secondly you put meta in my mouth when I didn’t use it. I said there is certainly always an unbalance BUT that is not talking about meta. Meta in your opinion is just the reaction to this unbalance. I repeat myself again. If you can play with the line ups that meta is irrelevant. It’s just the outcome of stupid players who can’t play in teams. And again, I can play without repairs and prammo! Can you do so? Edited by Globonaut, 14 January 2019 - 10:47 AM. How can you have individual team play? European Community → English Speaking Community → In-Game Vehicle and Map Discussion → Soviet Tanks → Poll IS-2Sh. Dreams come true!